Newark Town Council on 1st July 2010. Alan is a qualified member of the Chartered Institute of Public Finance and Accountancy. 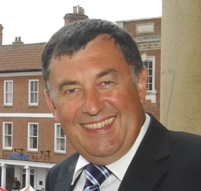 During his career he has worked in a number of District Councils in Nottinghamshire and Derbyshire. His last position was Chief Executive at Ashfield District Council, which he occupied for seven years, up to 2009. Alan is married with two daughters; he is a keen supporter of Nottingham Forest and enjoys golf as his main leisure activity.